* Suitable for rooms that are enclosed spaces; rooms without direct exhaust. * Diameter 100, 150 & 200 mm. 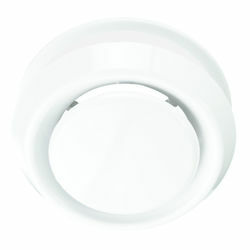 * Manufactured from white polypropylene (RAL9010); heat resistant to 100 C.
* Variable air flow control. * No leakage between valve body & mounting frame. * Simple removal for cleaning. * For mounting in places with small spaces, a clamping ring is added. * Suitable for rooms that are enclosed spaces; rooms without direct exhaust. * Diameter 100, 150 & 200 mm. * Manufactured from white polypropylene (RAL9010); heat resistant to 100 C.* Variable air flow control. * No leakage between valve body & mounting frame. * Simple removal for cleaning. * For mounting in places with small spaces, a clamping ring is added.